The Lingholm Kitchen was my favourite foodie discovery of 2016, at which point Lingholm became the subject of its own blog post. There’s nothing I don’t like about this café. It is contemporary, long, light and airy, and has an outside terrace for good weather. 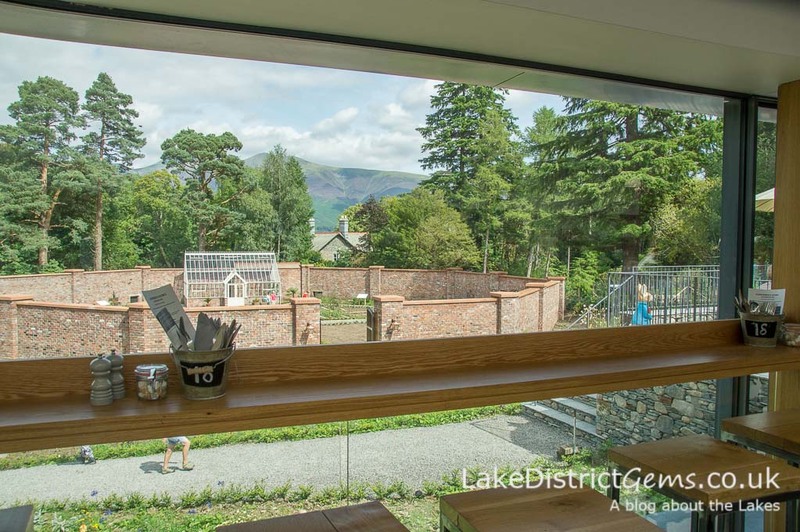 It has 100 feet of full-length glass windows, and overlooks the octagonal walled garden below, with a glimpse of the fells in the distance – so it has every weather eventuality covered! 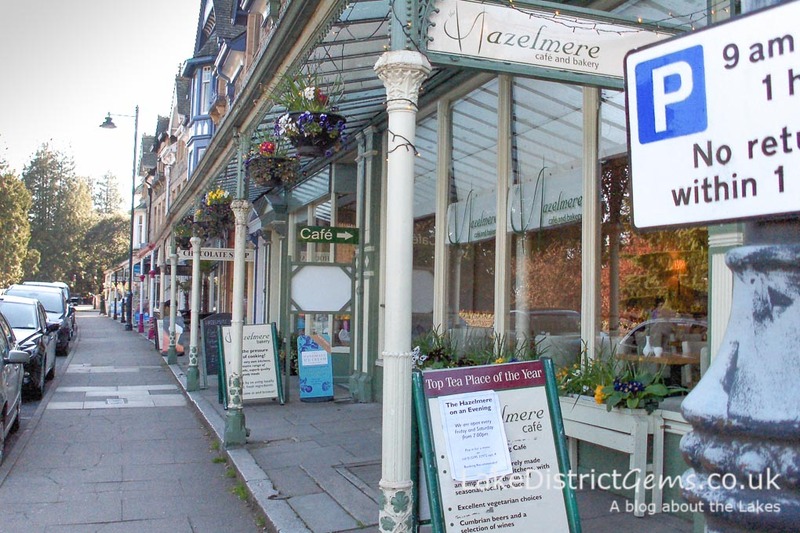 It’s always nice to support small independent cafés and coffee shops, and one I particularly enjoy in Ambleside is Café Treff, which is near the Bridge House and just opposite the Market Cross shopping area in the town. My cuppa has always arrived with a little wrapped square of dark chocolate, which is a thoughtful touch, and although I haven’t tried the cakes, they always look very generous in portion size! I enjoy sitting in the front of this café, where the windows look out onto the traffic and shopping courtyard opposite – a good spot for watching the world go by. Blackwell’s café is a modern and cosy place to stop for a brew in what was previously the servant’s area of the house. You’re made very welcome whether or not you choose to visit the house itself, and I’ve stopped for both tea and lunch here. The food is of excellent quality – you can find the menu online. 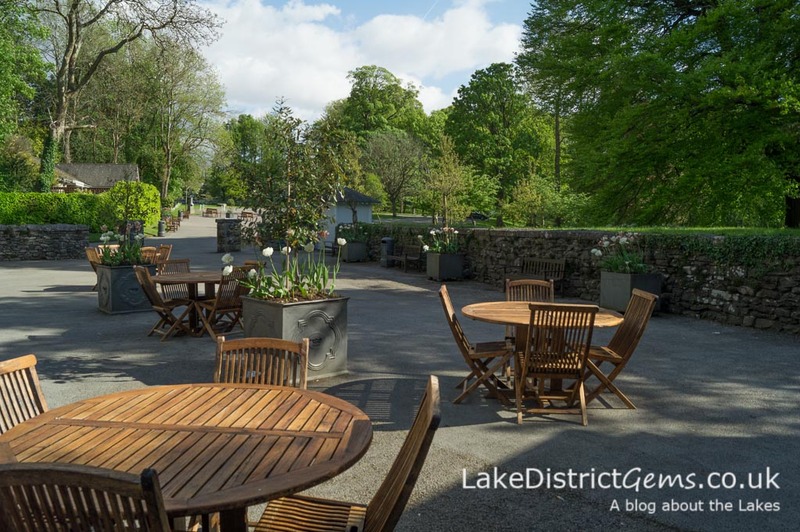 In the summer you can also enjoy sitting out at one of the tables on the terrace, looking towards the lake, and if you haven’t been before, Blackwell itself is well worth a visit too. The First Floor Café at Lakeland, as the name suggests, is on the first floor above Lakeland’s flagship kitchenware store. The view isn’t as grand as you might think when looking up at this impressive building from the outside, as you can’t really see far beyond the car park and Booths supermarket, but the expanse of glass and interior decor make it a really enjoyable place to stop off for tea. The café can be super busy at peak times (e.g. on a rainy summer weekend) – if this is the case, you’ll be given a ‘James Bond’-style gadget to take round the store with you, and it summons you when a table becomes available. 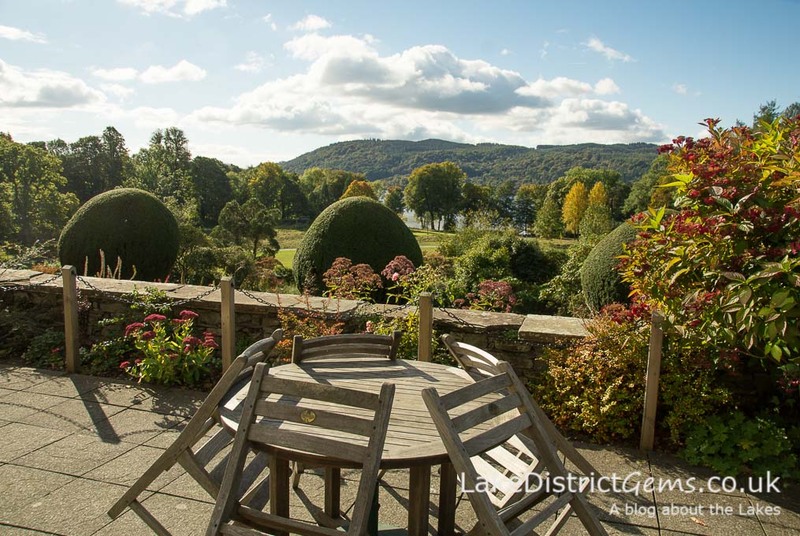 It’s been a long time since I visited Brockhole at the right time of year to enjoy a brew outside, but I visited the grounds in the autumn for a few photographs and the outside balcony was still busy with people relaxing in the end-of-season warmth with their morning coffee. It struck me what a beautiful place this would be to visit for a cuppa – the photo says it all really! Holker’s courtyard is another really nice spot in which to sit on a warm day. The courtyard is pretty and peaceful, and the whole experience is quite restful. A visit to the gardens at Holker Hall is really worthwhile too, especially in the spring. 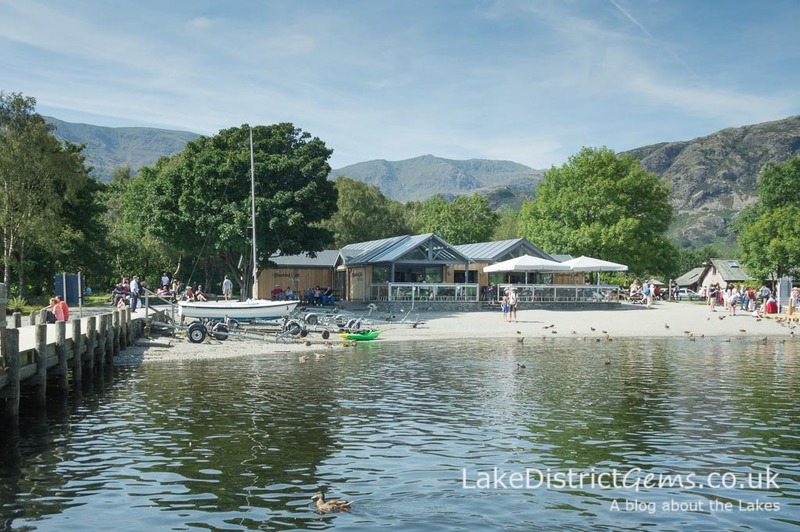 I’ll be completely honest and explain now that I haven’t actually eaten or had a drink at the Bluebird Café – unless you can count a quick and much needed takeaway tea which I got from the kiosk at the Coniston Power Boat Records Week in October! 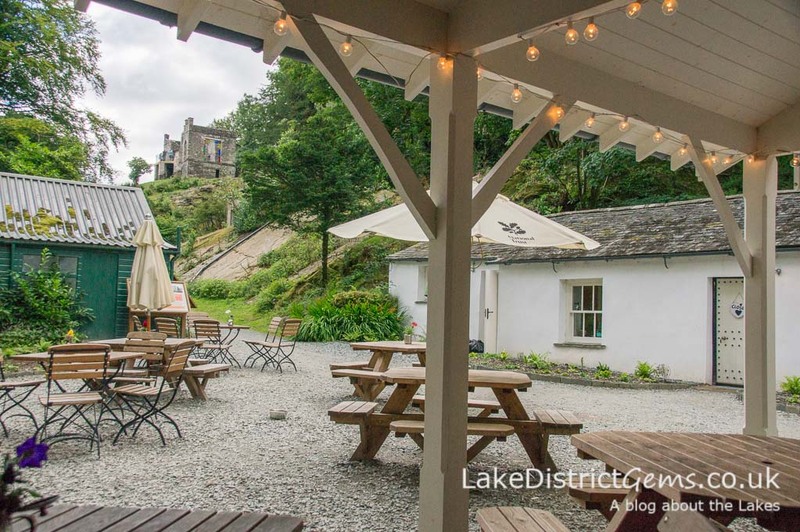 I’ve only ever heard good comments about this café though, and wanted to include it because it has surely one of the best locations for a café in the whole of the Lake District. 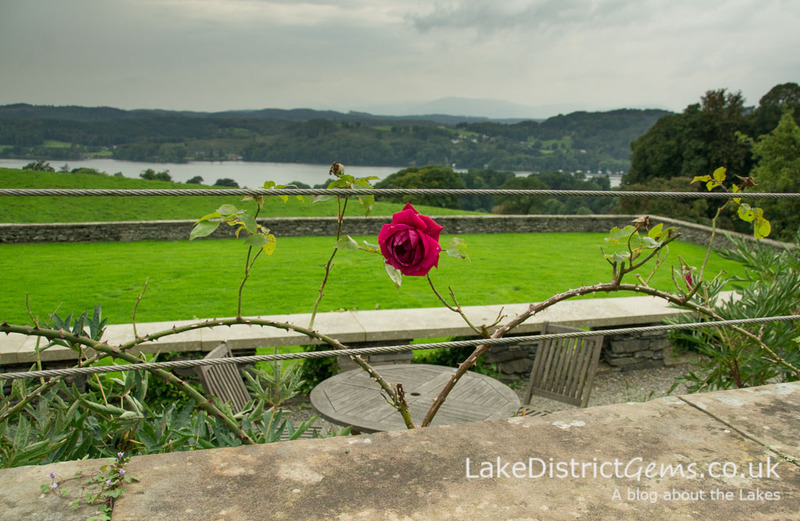 It looks out over the jetties belonging to Coniston Launch and Steam Yacht Gondola, and across Coniston Water itself to Brantwood on the other side. Although the Taste Café is the smallest of the three eateries at Rheged, it’s the one I am always drawn to. Your tea comes with rather artistic pottery mugs, and tastes even better accompanied by one of their hot filled paninis! You can read more in a past blog post I wrote about Rheged here. I don’t like to be cooped up inside if I can sit outside, so Sizergh is ideal for people like me when the weather’s warm enough. Sizergh has full-length windows so you never really feel totally shut away, but there’s also a nice long wooden undercover balcony outside, so plenty of outdoor seating even when it gets busy. 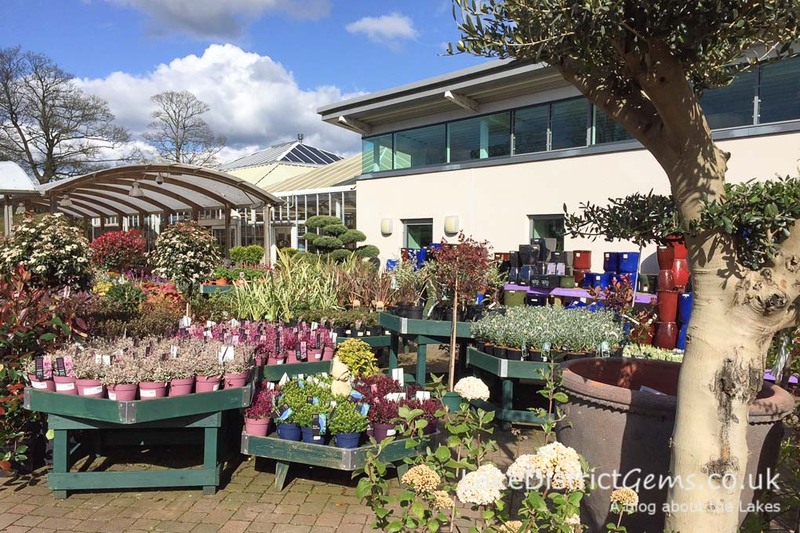 At Beetham Nurseries, you don’t just get one tearoom but a choice of two! The main café is a long, contemporary wooden building with floor-length windows looking out over the nursery, while the smaller tearoom is set within the food shop in the stone building next door. There are lots of outdoor tables along the entire length of both buildings, which is where I prefer to sit if it’s warm enough – it feels as though you’ve entered a peaceful, heavenly world, and you won’t want to move afterwards! The tea comes loose rather than in bags, and you get a generous amount of milk and extra hot water – I love the decaf loose tea, but at some point on most visits I find myself forgetting to use the tea strainer! 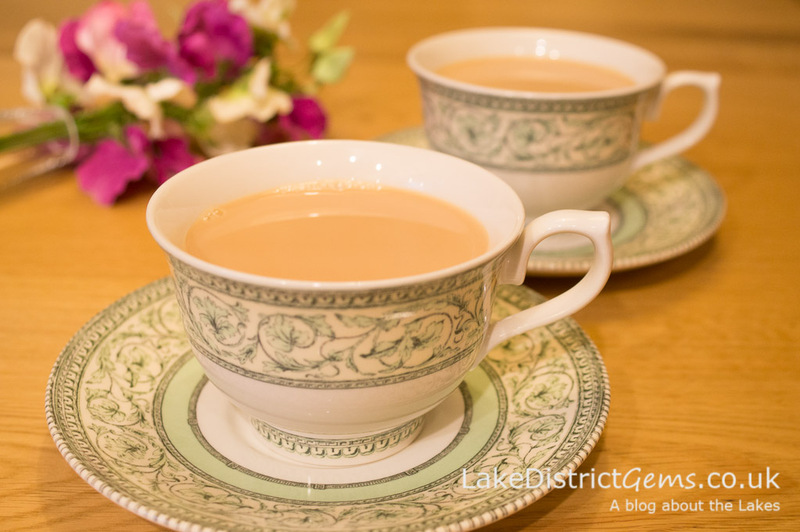 Don’t visit Wray Castle expecting a highly refined afternoon tea experience, as limitations with water supply to the building mean that tea is served in a disposable cup (with throw-away cutlery if you have any food). That said, it’s good tea, and it’s the view from the numerous picnic tables at the front of Wray that make this experience worthwhile. 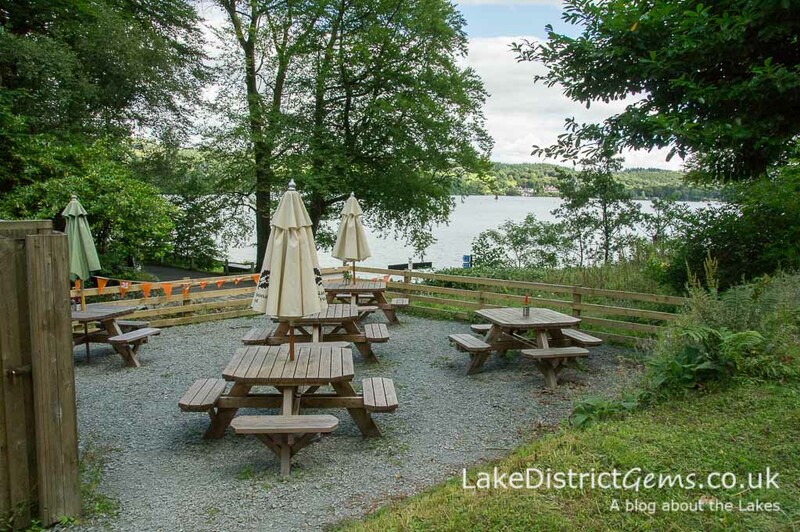 There is a parking charge if you’re not a National Trust member, and parking can be tricky at peak times, but if you’re planning to walk the western shore of Windermere, Wray is placed really well for a rest stop. I visited and wrote about Wray last year, so do take a look for more information. 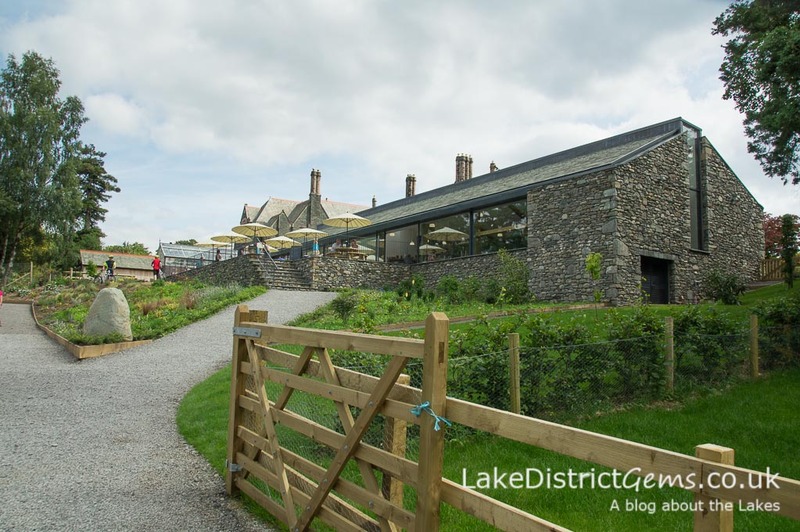 This relatively new café is a little gem if you are visiting the National Trust’s Claife Viewing Station, or are taking a walk in the area (including, again, along the western shore of Windermere). 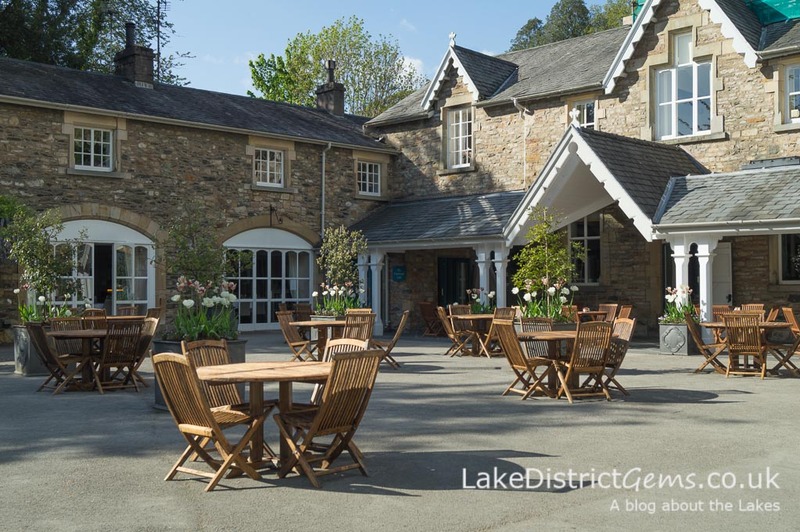 It has a cosy little fire inside in winter, and lots of picnic tables outside in warmer weather – some under cover, and a further set looking through the trees towards the lake. Tea is served in disposable cups (and food in disposable wrapping) because of practicalities at this remote site, but this does also give you the freedom to sit where you want or move on when you’re ready. 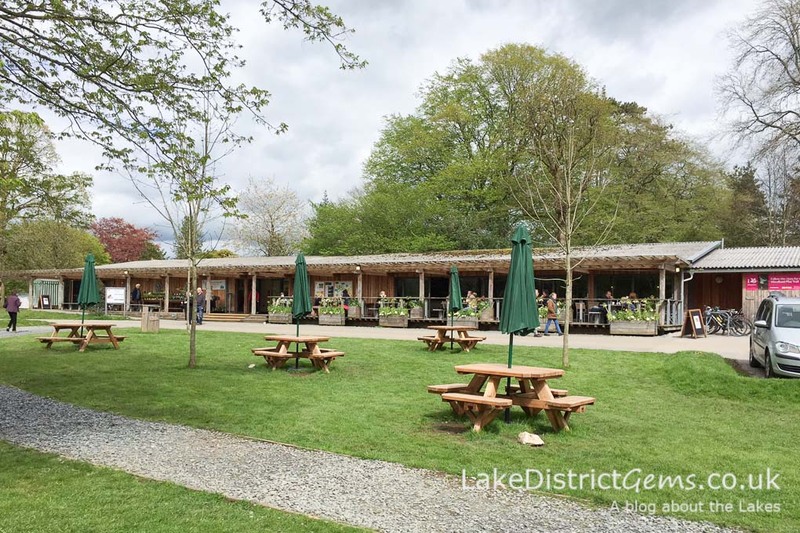 Just bear in mind that the toilets are not at the café itself, especially if you have children – they are a five-minute walk away on the side of the lake by the ferry (hand sanitizer dispenser only in the ladies’, as there are no sinks). There are also some further pay-to-enter toilets in the Ferry Nab car park on the eastern side of the lake, if you are heading to or from that area on the ferry. 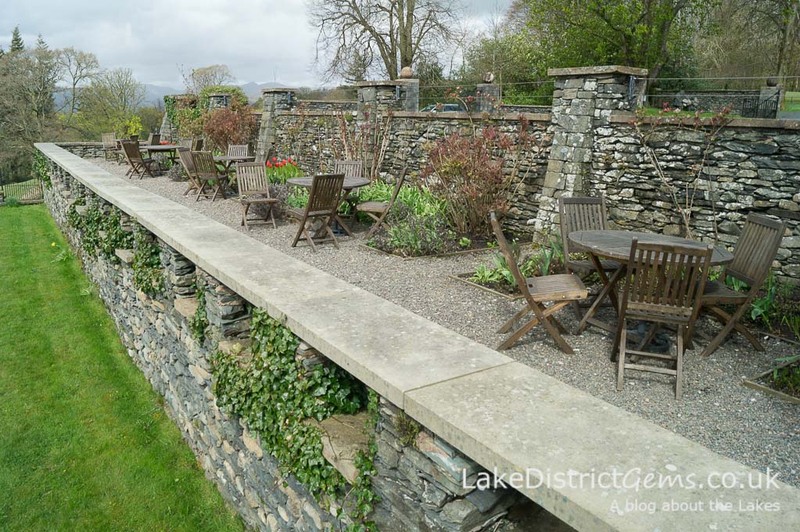 My first experience of Café Ambio was at its premises at the Lakeland Car Museum at Backbarrow. 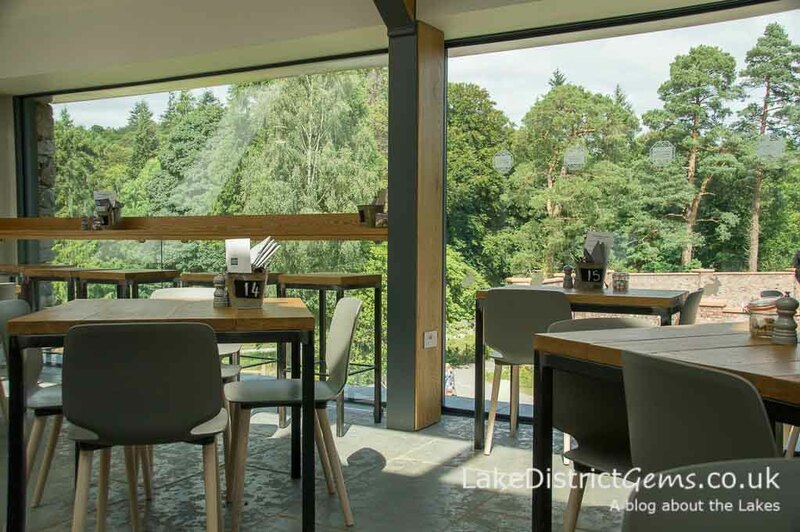 The café is light, airy, and has full-length windows overlooking the river running alongside. When the sun’s out, you can even sit out by the river, which I found quite a peaceful experience. 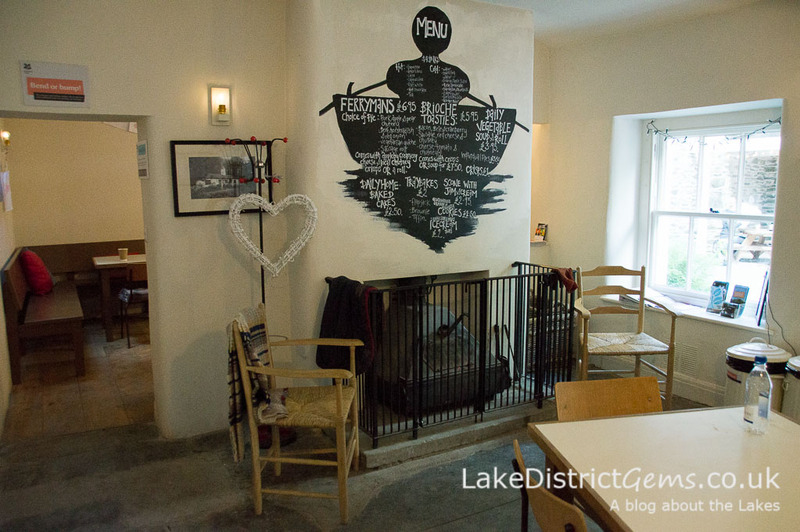 The tea and food both here and at Café Ambio’s Junction 36 site are excellent, so although I haven’t tried Café Ambio’s latest addition at Ings, between Kendal and Windermere, I can’t see why this wouldn’t be equally as good too. If the weather is good enough, a cuppa at Hayes has to be taken out on the balcony, with the best places to sit being a table at the end nearest the outside staircase, overlooking the garden centre (above), or at the opposite end of the balcony overlooking the car park to the hills behind. Have you a favourite brew stop that I haven’t mentioned here? If so, I’d love to hear your recommendations. Please also share your thoughts with other readers of the blog by leaving a comment below! Hi Janine. I enjoyed your suggestions. Hazelmere’s and Cafe Ambio are 2 of my favourites. Thank you for commenting Alison – it’s great to hear that you would recommend these too!